Mitchell Barnett was walking past the Thunderbirds playing field on Thursday afternoon when he saw a juvenile bald eagle swoop down to the field. "How do I rate its soccer skills? Definitely better than me," he said. "To me, it seemed like it was trying to pick up the ball." The bird made a few attempts to fly off with the ball, but eventually flew to a nearby tree. Ildiko Szabo, an assistant curator at UBC Beaty Biodiversity Museum, says she's seen behaviour like this before. "Birds have been known to do crazy things like this," she said. "I don't know why it would go after a ball. It certainly doesn't look like food to me." Note: The bald eagle's natural range covers most of North America, including most of Canada, all of the continental United States, and northern Mexico. It is the only sea eagle endemic to North America. Occupying varied habitats from the bayous of Louisiana to the Sonoran Desert and the eastern deciduous forests of Quebec and New England, northern birds are migratory, while southern birds are resident, remaining on their breeding territory all year. 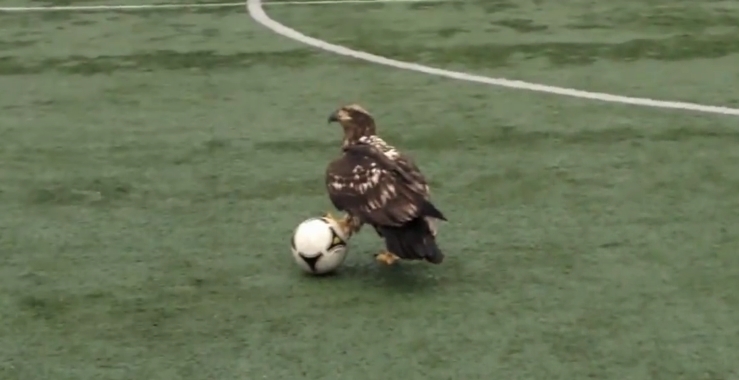 Responses to "Incredible Moment A Juvenile Bald Eagle Plays Ball On UBC Thunderbird Field"